Before you can present information to others, you must know its story. 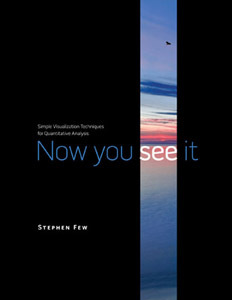 Now You See It teaches simple, fundamental, and practical techniques that anyone can use to make sense of numbers. These techniques rely on something that almost everyone has—vision—using graphs to discover trends, patterns, and exceptions that reside in quantitative information and interactions with those graphs to uncover what the discoveries mean. Although some questions about quantitative data can only be answered using sophisticated statistical techniques, most can be answered using simple visualizations—quantitative sense-making methods that can be used by people with little statistical training. Until Now You See It, no book has taught the basic skills of data analysis to such a broad audience and for so many uses, even though the need is huge, critical, and rapidly growing.